Broken skateboards are both the inspiration and the raw material for the Deckstool, Recycled Skateboard Stool. Super strong and surprisingly comfortable, the stool is held together by a skateboard truck. Due to the nature of recycled skateboards, every Deckstool - Recycled Skateboard Stool is unique. We randomly ship a stool from our inventory to fill an order unless a special request is made. Expertly crafted from real broken skateboards collected from skateparks and skateshops across the USA. All Deckstools are guaranteed to meet our high quality standards and specifications. Superior workmanship, design, and quality is guaranteed. 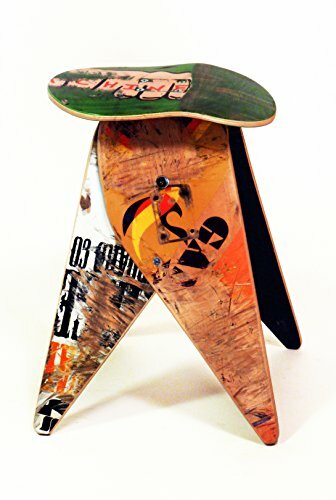 A great gift idea for a skateboarder or a fan of modern design and recycled art. If you have any questions about this product by Deckstool, contact us by completing and submitting the form below. If you are looking for a specif part number, please include it with your message.